Hyundai will continue their successful value escalation strategy in the car sales wars, now offering to lock down a year of gas at $1.49 per gallon for a year for buyers of new vehicles purchased between now and August 31st. We're just digesting the press release below so give us a few minutes to analyze it and give you some more details. But we do have to say — $1.49 a gallon sounds a lot better than the $2.99-per-gallon price-lock guarantee Chrysler offered last year! FOUNTAIN VALLEY, Calif., June 30, 2009 – With gas prices expected to push over $3 per gallon during peak summer travel months, Hyundai Assurance Gas Lock guarantees a year's worth of gas at $1.49 per gallon on most Hyundai models leased or purchased between July 1 and August 31, 2009. Hyundai Assurance Gas Lock complements Hyundai Assurance and Hyundai's 10-year, 100,000-mile warranty, and is available with special rebate and financing options on individual models. "Hyundai Assurance is a unique platform because it enables us to partner with consumers in ways that address their immediate concerns," said Joel Ewanick, vice president, Marketing, Hyundai Motor America. "We've extended Hyundai Assurance to cover gas prices just as peak summer demand traditionally strains budgets further, guaranteeing most new Hyundai owners a year's worth of low gas prices. It's another way we show consumers that, in this downturn, we're in this together, and we'll get through it together." The average U.S. price for regular-grade gasoline closed at $2.64 per gallon on June 29, 59 cents per gallon higher than its price at the end of April according to the Energy Information Administration.1 Regular-grade gasoline prices are expected to reach their summer seasonal peak in July, with a monthly average close to $2.70 per gallon, and many local markets over $3.00 per gallon. Hyundai Assurance Gas Lock enables consumers to save between $1 and $1.50 per gallon at the pump from current gas prices with the purchase of a new Hyundai. "Our research shows that nearly 40 percent of potential new car buyers are staying out of the market specifically due to uncertainty around future gas prices," said John Krafcik, CEO and president of Hyundai Motor America. "With Assurance Gas Lock, we're empowering consumers with gas price stability so they can make a confident vehicle choice. And for those buyers out there driving older gas-guzzlers that qualify for the new government CARS program, we think our fuel-efficient lineup of award-winning vehicles, combined with Assurance Gas Lock, makes Hyundai an unbeatable combination." To sign up for Hyundai Assurance Gas Lock, new Hyundai owners simply register their valid Visa, MasterCard, American Express or Discover credit card, or a Visa or MasterCard check card, at hyundai.pricelock.com. After enrolling, the consumer will receive a new Hyundai Assurance-branded card to be used for all future fill ups. The consumer is billed $1.49 per gallon of regular-grade gasoline, regardless of the price at the pump, and Hyundai pays the rest. (The driver may elect to purchase mid-grade gasoline for $1.64 per gallon, or premium gas for $1.79 per gallon as well, although all eligible Hyundai vehicles are factory-certified for regular fuel.) The card can be used at any gas station in the Voyager credit card network, which covers 93 percent of gas stations nationwide including brands such as Exxon, Chevron, BP, Shell, Mobil, 76, Texaco and many more. Consumers are eligible to purchase a maximum number of gallons equal to 12,000 miles divided by the EPA combined fuel economy rating for the qualifying model. Hyundai Assurance Gas Lock is standard on all new Accent (excluding base model), Tiburon, Elantra, Elantra Touring, Entourage, Sonata, Azera, Santa Fe, Tucson and Veracruz models, most of which are eligible for $3,500 to $4,500 in government CARS (Consumer Assistance to Recycle and Save) vouchers for those consumers with less fuel-efficient trade-ins. Consumers will be given the option of accepting the full rebate offered on an individual model, or may choose the Hyundai Assurance Gas Lock promotion, reducing the rebate by $1,000. 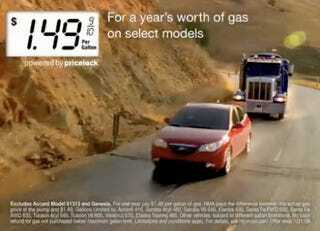 Four Hyundai models achieve more than 30 miles per gallon on the highway –Accent, Elantra, Elantra Touring and Sonata. Hyundai ranks third in corporate average fuel economy according the U.S. Environmental Protection Agency, so consumers will realize further cost savings by stepping into a more fuel-efficient model than they currently drive. Hyundai Assurance, the first program of its kind for an automaker in the U.S. auto industry, allows consumers to walk away from a financing obligation when certain adverse life events occur, providing protection from financial shortfalls that arise from vehicle depreciation (negative equity) up to $7,500. Hyundai Assurance and Hyundai Assurance Gas Lock complement America's Best Warranty as standard protection on eligible new vehicles financed or leased from a participating Hyundai dealer. For full details about the programs, visit: www.Hyundai.com. The Hyundai Assurance Gas Lock program is offered in partnership with Pricelock. Pricelock, based in Redwood City, California, is the world's first company to combine patented technology and commodities expertise to bring price predictability to the volatile $700 billion retail fuel market. The company also offers Carbonlock(TM), a unique, patented "green fleet" program that allows fleets and businesses to efficiently acquire certified carbon offsets and become carbon neutral. Pricelock can be found on the Web at www.pricelock.com.